On the weekend I went to visit Propaganda: Power and Persuasion, a new exhibition at the British Library examining state propaganda, from its origins in the ancient world up until the present day. If you’re interested in politics and communication it’s definitely worth a visit. The exhibition space itself is very dark and feels slightly old-fashioned, but the quality of the content and analysis combine to create a very stimulating experience. With over 200 exhibits, it has a good range of works; there are Napoleon-era paintings, posters from the Spanish civil war and Nazi films as well as modern day phenomena like tweets shown in a giant data visualisation installation. Curated by Jude England and Ian Cooke, curators of Social Science at the British Library, the exhibition explores the different ways in which the state has used propaganda to influence the thoughts and feelings of a nation. It’s organised by theme, rather than chronologically; there are sections on ‘internal enemy’, ‘external enemy’, ‘sport’ and ‘health’ amongst others. Whilst there’s nothing intrinsically wrong with this and it makes sense from an analytical point of view, it is slightly annoying that you can’t just pick a period which particularly interests you and immerse yourself in the communications of the era. There’s lots of video content (provided by the British Film Institute) and interviews with academics and commentators including Alastair Campbell, John Pilger, Iain Dale, Tessa Jowell, Noam Chomsky and David Welch, which all adds interest. Slightly annoyingly there’s only ever one pair of headphones to a screen, so you have to loiter with sharp elbows at the ready to get an earful. The exhibition will be accompanied by a series of events, including talks from political advertising luminaries such as Trevor Beattie. Matt Forde, an old pal of mine, is also hosting a comedy night – Political Party – in honour of the exhibition on Monday 15th July which should be fantastic. The exhibition costs £9 and is open daily until 17th September. 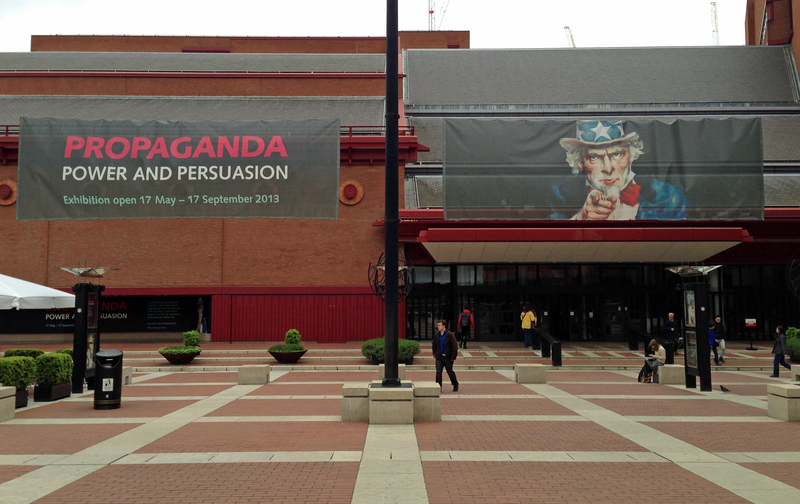 Pingback: Mostra sulla propaganda alla British Library | London's Calling: Londra Chiama!